Happy Monday! Is it just me or does the weekend go by super fast? It’s been a hectic weekend making sure that my family in Miami is okay but luckily everyone is fine and doing well! Thank you for everyone who has asked me if my family is okay. It means a lot and I hope that, if you or your family are in the affected areas, that you’re okay too. I wanted to share this casual and easy travel outfit because I recently went to Miami and this is something I would wear to go to the airport and travel (mind you, I was wearing something else and looked like a wreck but it’s okay). For me, I’m all about being casual while traveling. 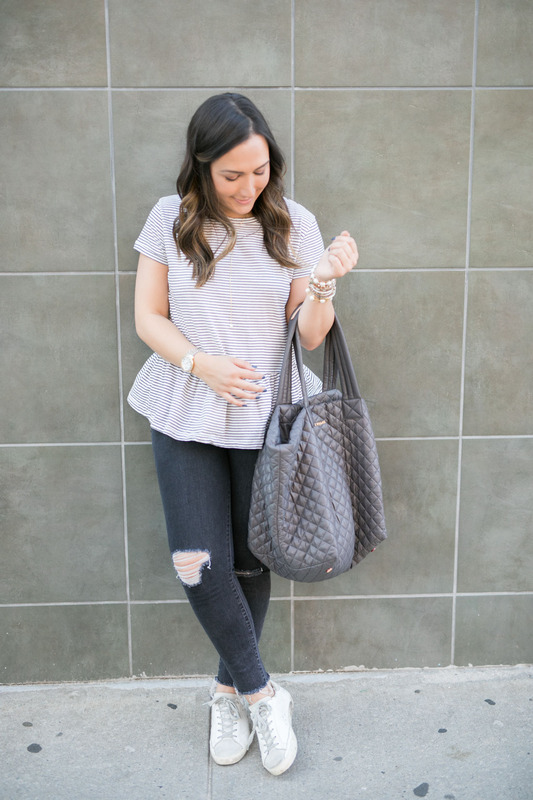 These jeans are super soft and comfortable and I love that they keep me warmer on cold planes! This top has also become my new favorite. 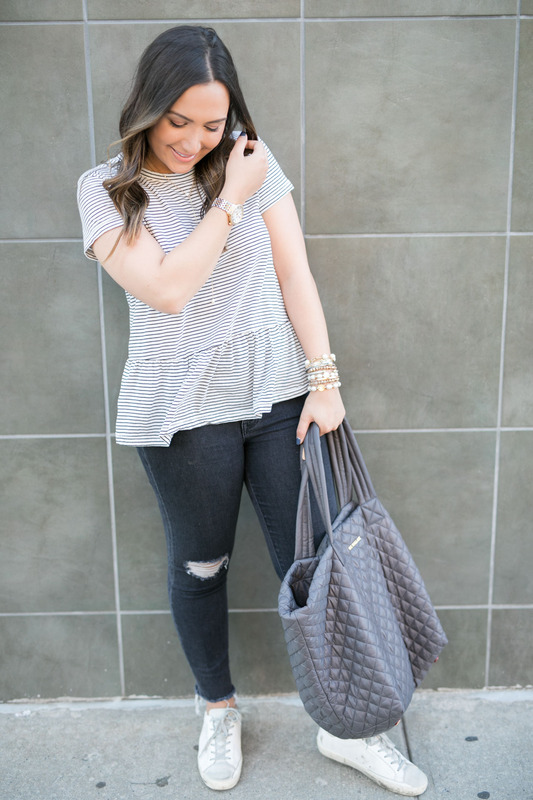 I love stripes and peplum separately, so when you put the two of them together, it just doesn’t get any better than that. My Golden Goose sneakers have been one of my biggest investments in terms of shoes but I love them so much! They’re so comfortable and have a little heel inside of the shoe so my back doesn’t hurt when walking through the airport (I’m flat-footed so little heels help me). One of my favorite things that I brought with me on my trip to Miami (and back to NYC) was this MZ Wallace tote. I am seriously so in love with it. It’s so spacious and has little detachable pouches attached inside. In there, I had my medicines, chargers and any other essentials I needed to keep handy. 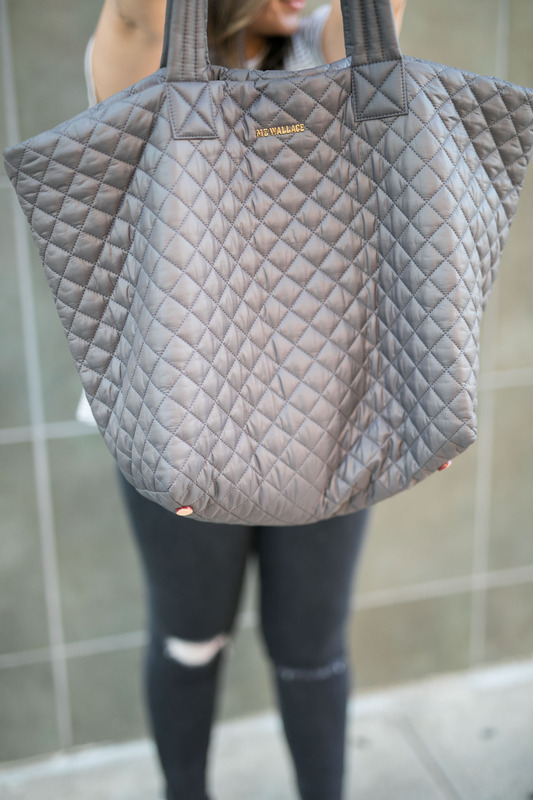 Not only is it a great bag for traveling but also for everyday. You can fit absolutely anything into it. I got the large Metro Tote because I wanted to be able to really pack everything in there. The material is extremely lightweight so you can put a lot inside of it without feeling like you’re going to break your shoulder. I got the magnet Oxford color, which I feel like is such a great color for every season and spices things up a bit more than black would. While traveling, I stuck my purse inside of there, my laptop, water, some snacks and more and was able to zip up the pouch and put it under the seat in front of me on the airplane. You can fold the bag, roll it up, basically do anything you want with it and it’s so durable. 100% my favorite new travel item! I even bring it when going to my parent’s house in Brooklyn and I need to bring a lot of things. It’s $225 but worth every penny – I promise. It’ll also be great for weekend getaways since it fits so much! Thanks so much for stopping by! What’s your go-to travel outfit? So cute, Lauren! 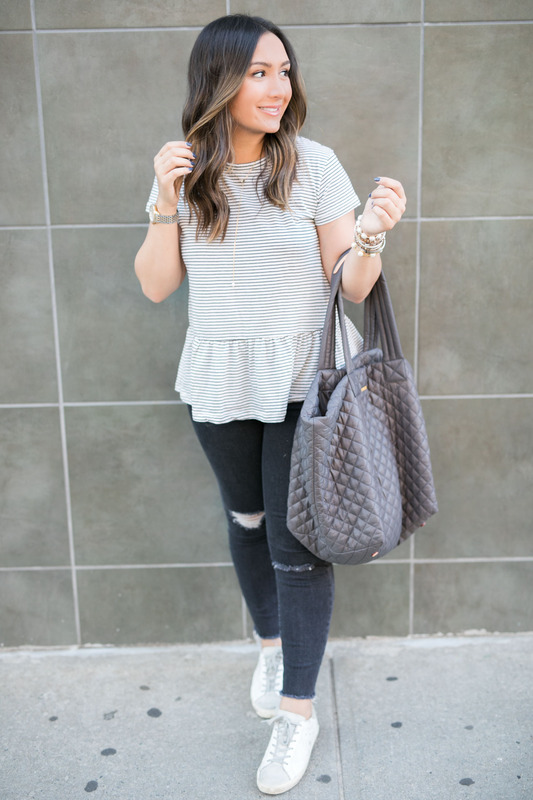 I love that peplum top. Certainly looks cozy! So glad the family is okay 🙂 Such a perfect travel look! I’m so glad to hear that your family is doing well! And what a perfect bag for traveling! 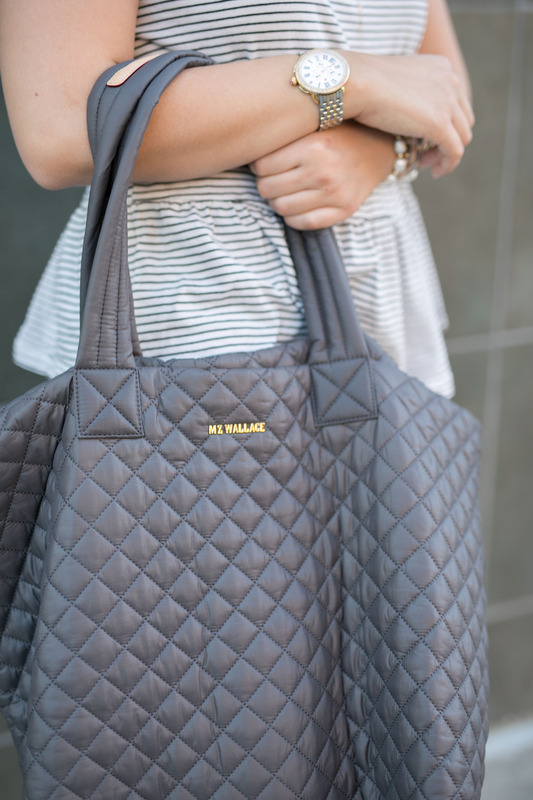 I need an MZ Wallace tote in my life! Amazing for running around the city! This outfit is absolutely perfect on you! Travel fashion is my favorite fashion. 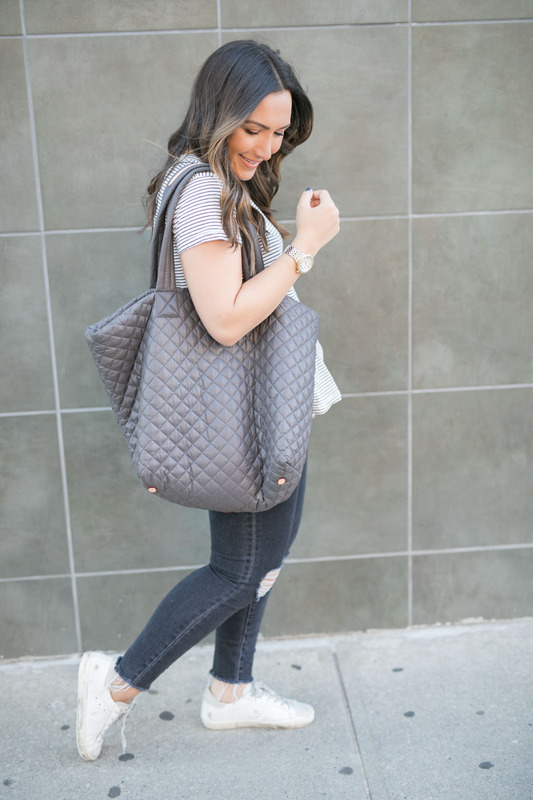 This is such a great bag! And I love you travel style! I cant get enough of that bag!! It seriously looks so soft and lightweight! Such a great look!! This so cute! 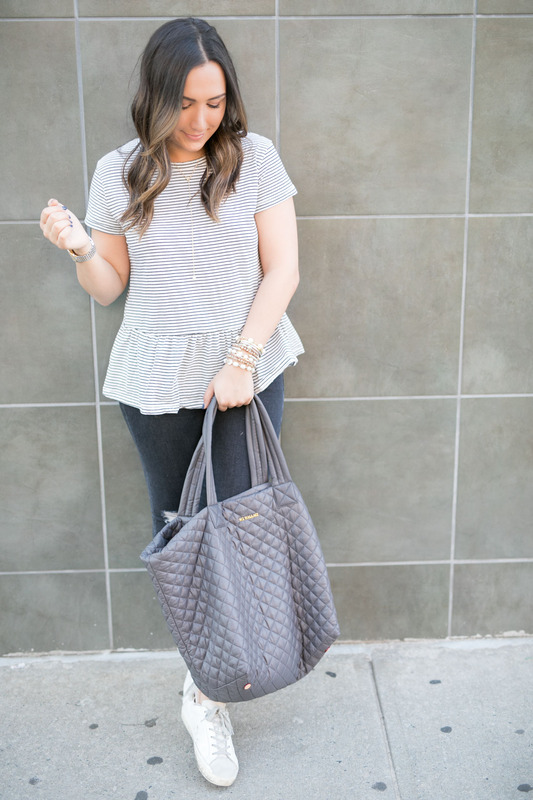 Love this peplum top!